Last week she gave her evidence in chief. Jiba is now facing grilling questions on her role to unlawfully authorise racketeering charges against former Kwa-Zulu Natal Hawks head Johan Booysen. The Mokgoro Enquiry is investigating her fitness to hold office. Both Jiba and advocate Lawrence Mrwebi are accused of misconduct and mishandling of high profile cases. Advocate Jiba was heavily criticised for authorising charges against Booysen. The courts found her actions to be unlawful however she is sticking to her guns that Booysen has a case to answer. She denied that she was under pressure to charge Booysen for political reasons. 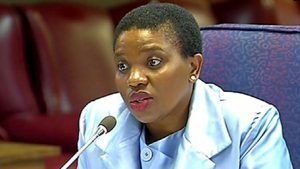 The post Jiba continues giving testimony at Mokgoro Enquiry appeared first on SABC News – Breaking news, special reports, world, business, sport coverage of all South African current events. Africa's news leader..